I Invested $5,000 Into Harmoney – Was It Worth It? Last year around July, I decided to diversify my interest investments out of term deposits and into the peer-to-peer market. The peer-to-peer market goes like this: Normally when I have $5,000 to invest, I put it in ASB and they pay me 2-3%. Then ASB goes and lends money to Rangi for 5-6% for his mortgage, or maybe even up to 20% for a personal loan. See how smart the bank is? They take my money for 3% and then charge Rangi 20%, making the easiest 17% in the country. The thing about greedy middlemen is, they’re the easiest to cut out. Because neither party actually needs the middleman in the end. All they do is connect a buyer and seller. If the buyer and seller can find each other on their own, the middleman becomes obsolete. This is what peer-to-peer lending is. Harmoney is a peer-to-peer lending platform that cuts out the bank, and lets me lend money directly to the borrower. I get a higher rate, the borrower gets a lower rate, everybody wins. WHAT IS BITCOIN? A FREE BEGINNER'S GUIDE FOR KIWIS. ENTER YOUR EMAIL BELOW AND I'LL SEND IT STRAIGHT TO YOUR INBOX. The interesting thing is, we’re not actually cutting out the middleman here. All we’re doing is replacing the very greedy middleman (the bank) with a less greedy middleman (Harmoney). Harmoney still takes a cut. It’s just a lot less than what a bank takes. Harmoney is actually a very clever system. Instead of lending large lump sums of money, every loan is split into parcels of $25. That means if I wanted to borrow $25,000, I wouldn’t get that from one lender. Instead, 1,000 different people would loan me $25 each. If I ended up forfeiting on the loan, the most any lender would lose is $25. This allows you to diversify your loans really heavily, even if you only put in a few hundred dollars. This is going to affect your returns a lot. For example, if you invest in some A1 grade loans, the listed interest rate is 9.99%. However, Harmoney is going to take 21.25% off that, so your actual interest rate is going to be 7.87%. 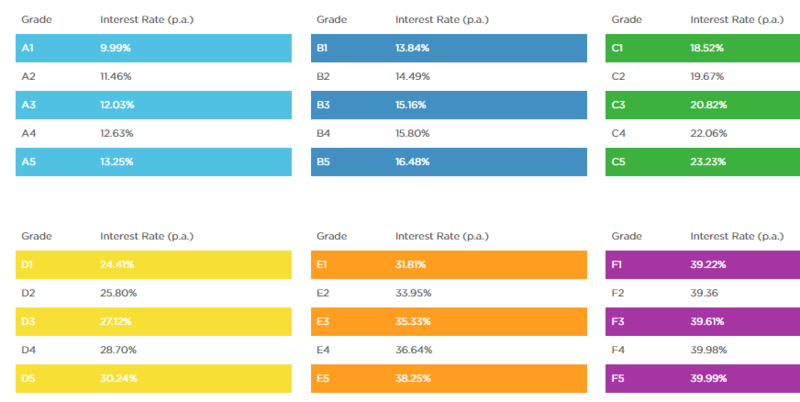 If you invest in some F-grade loans, the listed interest rate is 39%. However, after Harmoney takes a slice that rate comes down to 30.72%. That’s still a crapload better than what a bank gives you, but remember your bank deposits are secured and even under a government guarantee. If your Harmoney loans get defaulted on, your money’s gone and you can’t get it back. So you need to decide if the extra risk is worth the premium. Some borrowers will opt in for Payment Protect, which is kind of like insurance for the borrower. If the borrower decides to take out Payment Protect, it means their loans get waived in the event of death or serious illness etc. The effect of this is your principal actually increases, so borrowers need to pay you more than you actually lent, which is nice. Of course Harmoney takes a cut off this as well, I think it’s around 20% but it’s a little confusing, I didn’t really bother reading into that part too much. You can read the full details on Harmoney’s info page. In July last year I decided to invest $5,000 into Harmoney to see if it was a legitimate interest earning vehicle. I didn’t actually manage to get it exactly like that, but it was close enough. It actually takes quite a long time to get $5k onto the market since you’re investing in $25 parcels, so by the end I was just taking whatever loans became available, even if it didn’t fit my allocation perfectly. I also didn’t distinguish between A1 and A5, or C1 and C5 etc. I just went with the overall letter grading to keep things simple. I also was reinvesting my interest into new loans for the first couple of months, until I decided to just start pulling funds out as interest came in. Harmoney has a handy “Auto-withdraw” feature, so every Monday it automatically sends any available funds to my bank account. It’s always nice to see a new chunk of cash come in each week! Here’s what my Dashboard looks like after 9 months:. You can see my Rate of Annual Return is at 11.39%, which is far superior to the term deposit rates I’m getting at ASB, which are around 3%. I’m also slightly above the platform average of 10.36%. You can see from my dashboard above I’ve only had $26.21 charged off, which is really just one parcel, so that’s a really good result. I expected a lot more charge-offs than that. As you can see, the loan was graded an E4, which is obviously super high risk. The lowest is an F5, so this one is pretty close to the tail end of borrower quality. What’s the incentive to lend to him/her? Well, the interest rate is a crazy high 36.64%. Well, if he meant “go on holiday without any worries of paying me back” then he succeeded with flying colours. Looking at the report he paid back a total of 96 cents. So basically, the guy went to Hawaii, came home, declared himself insolvent and had a free holiday on me. How does this happen? Surely this guy should be punished somehow? Well, not really. I’ve worked in accounting and I know how this works – he’s been written off as a bad debt and it’s onto the next. I highly doubt Harmoney is still chasing him for my money. They have better things to worry about. So what are the consequences for the borrower? Well, he’s probably just had a hit to his credit score, so it will be hard for him to get a mortgage or credit card in the future. That’s it. In terms of the money he borrowed from me, that’s well and truly gone into a few refreshing cocktails on a tropical beach somewhere. To be honest I’m not even mad. To whoever was behind this master plan, I sincerely hope your holiday was great. To avoid this happening to you, however, I’d advise you to stick to loans graded in the high C’s and above. Lend to people who actually have businesses and mortgages and credit cards and care about their credit scores. The E and F loans have high interest rates but that means nothing if the borrowers just go on holiday and never pay you back (which is probably what will happen). I don’t actually like the way Harmoney lays this out. I used to compile financial statements for a living and I can barely follow it. For the average person it must be total gibberish. To keep it as simple as possible, I’ll just look at it from a perspective of cash flow. It says I’ve got $217.18 available, which should be auto-withdrawn to my bank account any day. 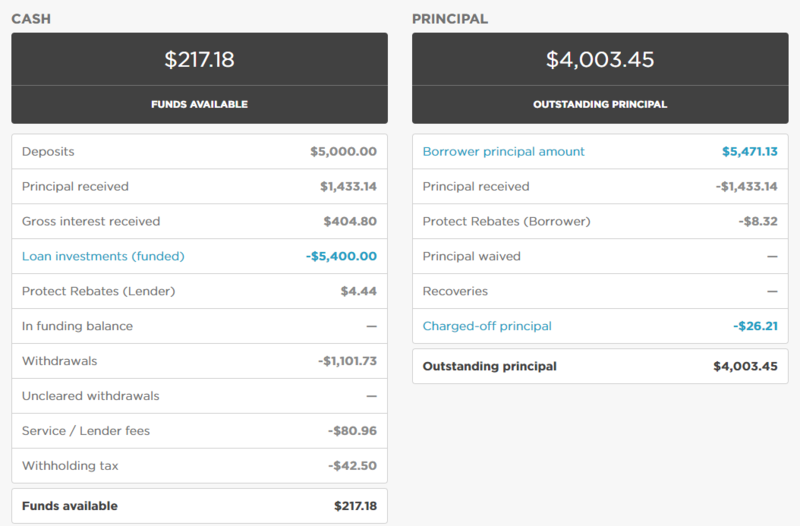 I’ve also got $4,003.45 in principal still outstanding, and I’ve already withdrawn $1,101.73. So essentially my $5,000 has grown to $5,322.36 in 9 months. If you annualise that it should grow to roughly $5,429.82 after 12 months. That’s an annualised growth of 8.6%. Note, that’s not pure ROI because I’ve been withdrawing capital, and many borrowers pay off loans early, plus it includes RWT already taken off. That’s why it’s different to the RAR shown in my Harmoney account. Still, 8.6% is better than any bank you’ll find. Overall I think Harmoney is a decent way to diversify your interest earnings, if you have reasonable risk tolerance. My current annual return of 11.39% (or 8.6%, whichever way you want to look at it) is far superior to anything you’re going to get at any bank, credit union, convertible note or bond, so as far as pure returns go this is the best returning interest investment you’re going to find. Do remember though that these loans are unsecured. It’s not nearly as risky as something like cryptocurrency, but significantly more so than a standard bank deposit or government bond. If we’re unlucky enough to see a serious recession that sees a lot of people go belly up, you could be in for a significant hit. When times are good, however, it seems to be a nice one to have in your portfolio. An update to this post was written on 2 April 2019. Click here to check it out. Hi, I have a question that I haven’t been able to find an answer to. Can you help? The question is: is it possible to retrieve the money you invested using just the interest?. 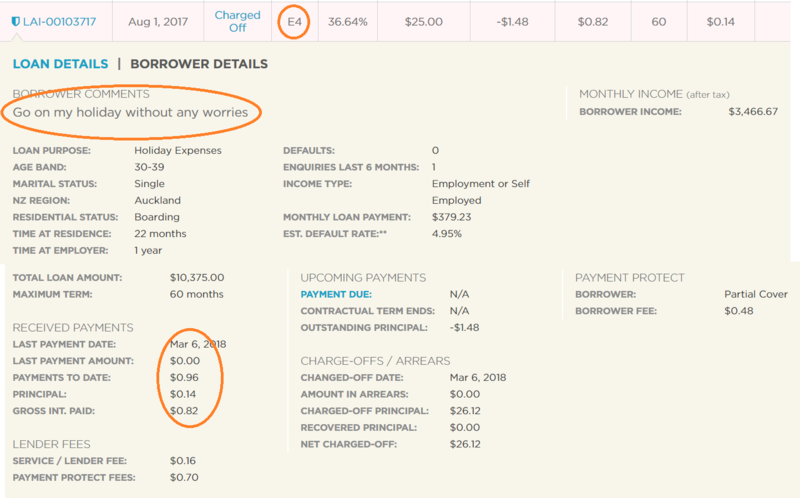 I invested only $150, $25 into 6 loans (just wanted to see how it worked) and over the year I’ve gaind about $20 intrest does that mean I will have to wait 7 years (and keep reinvesting the principal) to get back the $150? If you want to double your money, then yes it will take around 7 years at that rate. At a bank you will be getting around 2% interest, so to double your money at the bank will take much longer, closer to ~45 years! It is like reverse compounding interest. If the loan is paid back the returning interest gets smaller over time. So if you don’t reinvest and leave your returned money in the cash account your interest will be, maybe, half what you expect. However if you keep putting your returned principal + interest back in then you continue to get interest at your chosen rates. But expect your money to be out of action for 3-5years at most. In my experience most loans don’t got to term, they re-write or they pay back early. Your Lender Fees Seem incorrect. 1.25% is no longer so depends on the date of loan. 1.25% was dodgy because they were doing rewrites and still taking their full cut which was eating significantly into the Interest that a Lender had already received. They should have been taken to the FMA and been fined, or required to pay back investors. Now they have Payment Protect, which as you say “Is Confusing”, be weary of a company that put jargon and technical speak in the way of simple understanding. They make it difficult to understand for a reason. They were clever with the 1.25% Service, and it was great returns until they turned on the marketing engine and did 30% rewrites, cause returns to sink back to earth, but they still got their full whack. Many thanks for helping clarify this dashboard. Can you help me understand how profit ($322.36) can be more than interest (minus fees and taxes) (about $280) ? Or, what the “Borrower Principal Amount” is? Any help translating this gibberish would be greatly appreciated. What Can We Learn From The Cryptopia Hack? 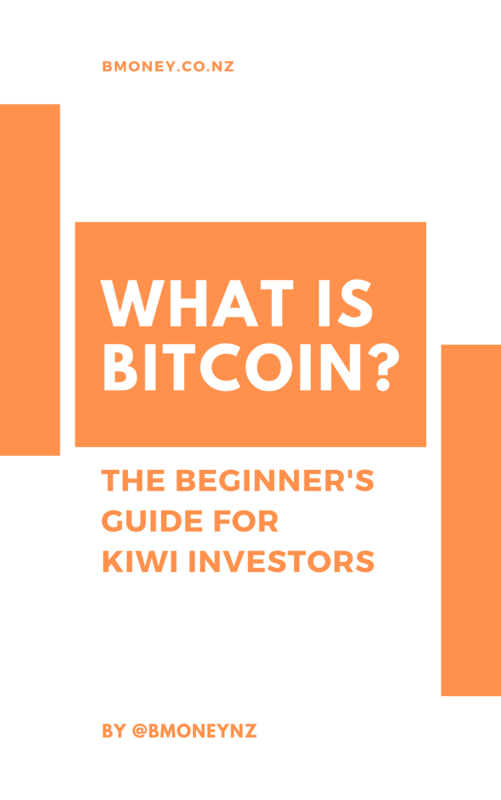 The Kiwi Investor's Guide To Bitcoin. Yours free. 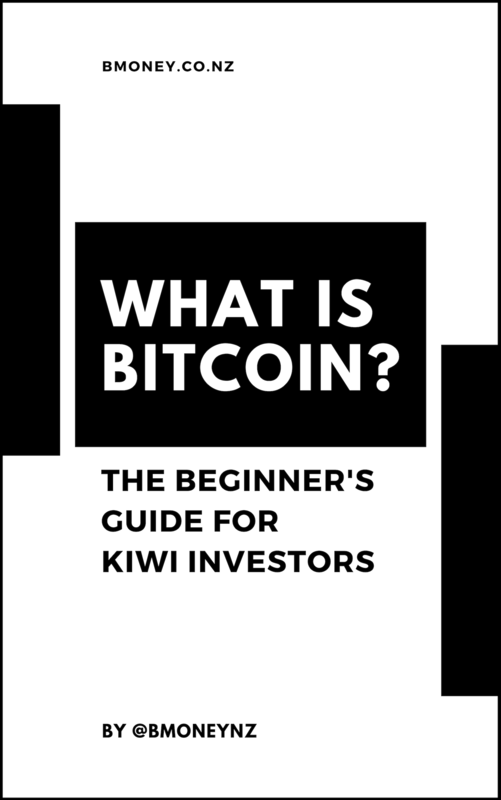 A BEGINNER'S GUIDE TO BITCOIN, FOR KIWIS. ENTER YOUR DETAILS FOR FREE ACCESS.